Toronto had a warm spell and the snow melted. Now it’s cold again, but at least the streets are dry, so it’s time to take the Bromptons out for their first spin around Toronto! 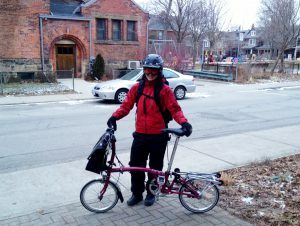 This is me and my Brompton. 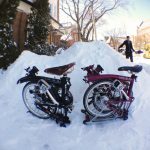 Yes, the Brompton is a stylish European bike and it’s probably embarrassed to be ridden by a Canadian girl wearing a snowsuit and snowboarding helmet complete with goggles, but that’s the way I roll when it’s -10 degrees Celcius outside. My Brompton will get over it. 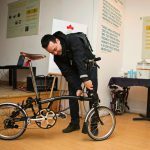 The Brompton’s tiny front tire can turn on a dime! So different than my road bike. But fun once you get used to it. I was pathetically slow at folding up the Brompton on my first ride out. It’s been two weeks since we picked them up, and I’d forgotten how to do it. Unlike Pier, I have not been practicing folding and unfolding my Brompton in the living room. It probably took me a whole minute to fold it. However, after the third time I was down to 30 seconds. And I’m sure I’ll be quicker when the whether gets warmer and I’m not trying to manipulate the levers with mittens. The gears. I am already in love with the 6 Speed Brompton. Some people have complained on other blogs that the gears are spaced too far apart, but personally, I like that. I find on my 21 speed roadbike that the gears are so close together that I often downshift through four in quick succession to get to the gear I want. But on the Brompton, one shift down is perfect. Another great thing about the gears on the Brompton – the 3 Speed hub (which is one half of the 6 Speed gear system; more on that in another post) lets you shift when stationary. This is awesome since I never remember to downshift when I’m braking for a stoplight. And with the Brompton, I don’t have to because I can downshift even after I’ve come to a full stop, and be ready in a lower gear when the light turns green. So those are my first impressions of riding my Brompton. It’s still a little slippery on the streets, but when it’s not Pier and I will have to race the Bromptons to see how fast they go.